Thanks for looking at our Multipet International 6" Lamb Chop! Like the song that has no end the timeless appeal of Shari Lewis and Lamb Chop continues to bloom in the hearts and minds of millions of baby boomers and their children. 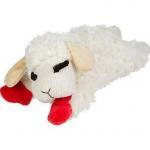 Shari Lewis beloved Lamb now a classic loveable soft plush dog toy with squeakers!.